Slot machines have been a regular part of casinos as far one can remember. In fact, the first prototype of the modern-age slot machine was developed way back in 1891 by a couple of highly intellectual gamblers from New York, namely Sittman and Pitt. It was based on poker, which gave rise to the name pokies as the Australians call it. The conventional slots have come a long way since then. Let us trace their offbeat evolution and rich history over the years. l A Brief History of Online Slots: A slot machine, informally fruit machine, the slots, poker machine or simply slot, is a casino gambling machine with three or more reels; depending on how symbols are matched and what are known as play lines as well as the value of each symbol, the play wins or loses a sum of money. There are thousands of symbols used across slots and winnings are stipulated before hand. Click here for more about slot machine symbols. Since slot machines were so popular in brick-and-mortar casinos, some of the very first online casinos which launched in 1994 housed virtual slot machines too. Microgaming was not only the first developer to successfully launch a workable internet casino platform, but also at the forefront of online slot gambling. Four years after online casinos saw the light of day, Microgaming invented the world’s first networked progressive jackpot slot game called Cash Splash. This highly advanced progressive jackpot software is used even today by most of the providers internationally. l Before the Rise of the Slots: Did you know that slot machines were used for many other purposes before they entered the gambling arena? Vending machines were a relatively new phenomenon back in the 19th century. Since they had slots for coin insertion, the term ‘slot machine’ was initially used to refer to them. Vending machines eventually brought forth the earliest iterations of modern gambling machines in the 1880s. However, the coin inserted in the slot wasn’t the bet. It was merely a way to start the race between say two toy horses. The people flocked around the machine would then wager among themselves for the winner. l The Earliest Slot Machines: The late 19th century beheld quite a few innovations in terms of gambling machines. The coin-dispensing machines first made their appearance sometime in 1888. The symbols on those machines were either numbers or colors. You simply needed to pick the winning one for the inbuilt balancing scale to tip the coins out. These machines didn’t have reels to display the results, but rather a circular disk and pointer. To be honest, it was a pretty complicated mechanism and cost quite a lot to house one. l The Golden Years: The final decade of the 19th century saw groundbreaking developments in the gambling machinery industry. Sittman and Pitt’s poker based machine was a huge hit among the masses. It had five drums depicting a hand in Hold ‘Em. Folks were dispensed coins depending upon the strength of their hand. Charles Fey was the first to depict symbols on the reels, which became an instant success. He also manufactured a simpler version of the then-prevalent gambling machines, called the Liberty Bell. Over 100 of these Liberty Bell machines were developed and spread throughout San Francisco by 1906. Then the memorable earthquake hit the area and destroyed most of the machines. l The Opposition: Charles Fey, though disappointed by this unforeseen catastrophe, was not disheartened. He kept manufacturing the machines until the government banned their production in 1909. The law had mainly been passed because of the clergy who had been opposing the gambling machines since their inception. But Fey was not one to give up. Along with a few of his colleagues, he manufactured and sold several machines that didn’t carry any coin slots. Quite like the earliest gambling machines, the betting was conducted at the bar counter. l The Rise in Popularity: Though Charles Fey was fighting to revoke the law passed against slots in San Francisco, many other manufacturers decided to flee to other regions. Gambling wasn’t exactly legal in other parts of the US, but no other state had passed a specific law banning slots. By 1920, the allure of slot machines had spread to many parts of the country. Several states gradually started legalizing gambling, post which even the Great Depression and the World War II couldn’t hamper the prospects of the slots. l In the Aftermath of WWII: Citizens of the country may still have been reeling from the destruction caused in the wake of WWII after it ended in 1945, but that didn’t stop them from indulging in a bit of gambling. Several state governments started legalizing the slots, if not poker dens, due to the enormous tax benefits offered. Bet multipliers (winnings proportional to the number of coins inserted) were first included in the slot machine algorithm some time in 1950.
l The Technological Advancements: Las Vegas saw some of the huge advancements in the slots since the 19th century. 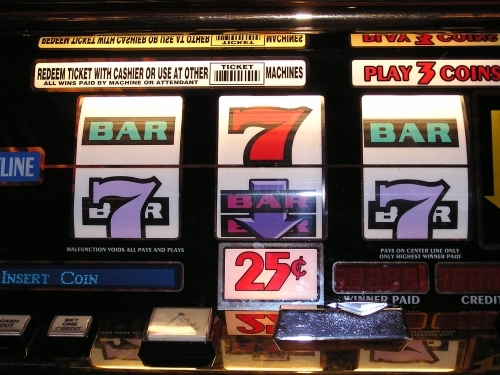 In 1975, the first video-based slot machines were introduced in the city’s casinos. However, the reels on the monitor and the automated button-spin didn’t hold much appeal to the regular gambler. The sounds of the handle-pull and the reel-snaps, though duplicated well by the video machines, were nothing compared to actually pulling the handle and hearing the mechanical reels snap into place. Nonetheless, people had to get over it since the monitors were here to stay.